Kneaders, or Kneading Mixers are high intensity mixers for cohesive solid materials. There are a lot of kneader machines in the market, but the most popular one is Double Arm Kneader. Double Arm Kneaders are equipped with two mixing blades mounted in a W-shaped horizontal trough. There are a variety of Blade Types and different Blade Actions available. 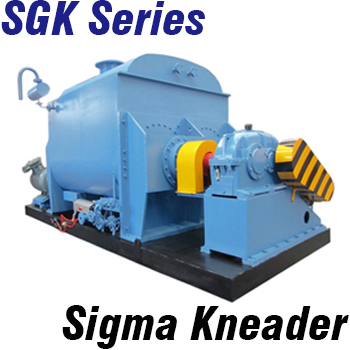 For more than 30 years, NKM Machine has been dedicated to design and manufacture of our range of Double Arm Kneaders, of which the most commons and popular models are our SGK series Sigma Kneaders and DPK series Dispersion Mixers. This design is best suited for universal applications. This may be positioned with either tangential or overlapping action. 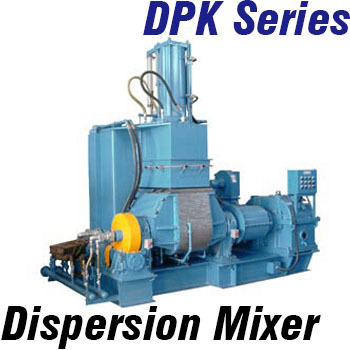 Used for a superior dispersion of products difficult to mix such as rubber, plastics or abrasive materials. Also called Fishtail blade. Suitable for mixing cellulose materials and highly viscous products such as gum. For product which requires less shear force, providing a smooth folding action; excellent for mixing a fiber reinforced product, available in 135 and 180 degree spiral. This agitator requires less power than sigma blade and it is used for sanitary applications. The blades in tangential design rotate in the trough meeting tangentially. The front blade generally rotates faster than the rear blade, usually in the ratio of 3:2. Tangential blades are used for universal applications such as adhesives, rubber compounds, flush colors, dyes, and pigments. The blades overlap above the saddle of the chamber. The relative position of the two blades is fixed, and the rotation speed is the same for the two blades. Materials that flow freely are mixed using the overlapping blade action, such as carbon pastes, clay coating, creams, and ointments. This design offers a faster interchange of material from one compartment to the other. The overlapping blade produces a lower kneading and shearing compared to the tangential blade action.